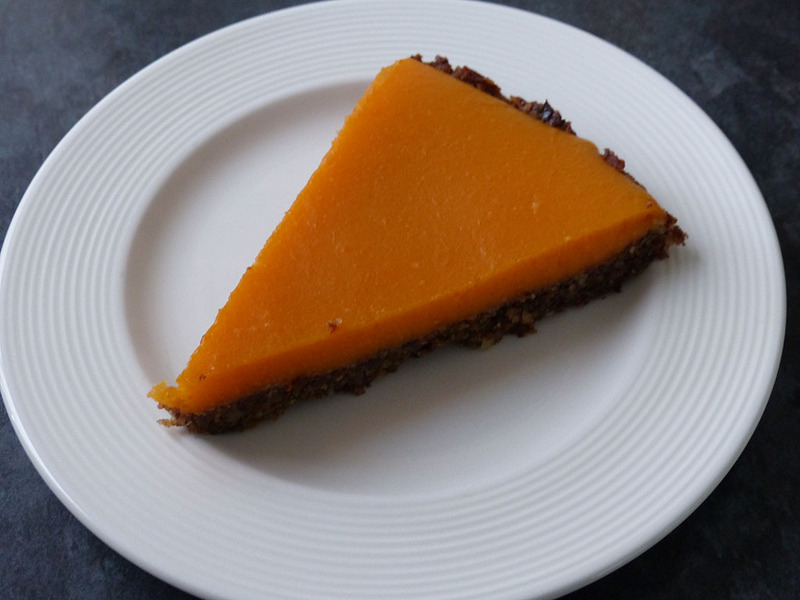 Velvety smooth, vegetarian and vegan pumpkin pie. Although this vegan pie takes 1.5 hours to make (plus 2 hours to set), it really is worth the effort. Velvety smooth pumpkin filling on top of a gluten free base made with pecan nuts and maple syrup. Mix the cracked linseed with 2 ½ tbsp water and leave for 5 minutes. Put the buckwheat flour, pecan nuts, dried prunes, coconut oil, maple syrup, ground ginger and salt in a blender. Add the soaked linseed and mix until it forms a ball. Grease and line a 28cm round baking form and add the mixture. Smooth it out using the back of a spoon. Prick with a fork and bake in an 180C (gas mark 4) oven for around 10 minutes or until the bottom is baked. Mix the corn flour with 4tbsp water. Add the corn flour mix and the Vegeset to the pumpkin mix and bring to a boil. Leave to boil for around 1 - 2 minutes until you see it thickening. Add the pumpkin mixture pudding to the form and leave to set in the fridge. This can take up to 2 hours.